What makes some liquids mix together, like water and methanol, but others like water and oil, do not? Here is a copy of what we observed in a table, now I'm not too sure about the Iodine tests because when I asked the students to show me their results I saw that none of their test tubes were labelled. So we'll take those results with a grain of salt. I've colour coded the observations to make it easier to read - green text for those that mixed together, red for those that did not, orange for those that showed some signs of mixing but only slightly, and pale brown for the test that I would like to repeat again in the future to confirm. So before we get to why some things dissolve in others, let's examine the structures of each of these solvents in a bit more detail, and see if they have any clues within them as to why they mix or not. Let's start with water. 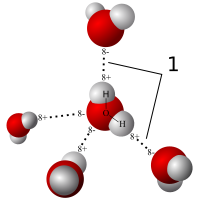 Water is a bent molecule comprising Oxygen and Hydrogen. What gives water most of its interesting properties is because it is so very polar. Polar means an opposite character or tendency - in this case we are talking about charge - a positively charged pole, and a negatively charged pole. The oxygen atom is much more electronegative than the hydrogen - this means that oxygen has a greater attraction for electrons than hydrogen has. This will cause an unfair sharing of electrons between them across the covalent bond - most of the time the electrons will be slightly closer to the oxygen than the Hydrogen. As a result, the Oxygen will be slightly negative, and the Hydrogen will be slightly positive, and since water has one of these polar bonds on each side (and they don't cancel each other out) - the overall molecule has a permanent dipole. This dipole enables the water molecules to stick together with other water molecules by the electrostatic attraction between the slightly positively charged pole of the Hydrogens, and the slightly negatively charged poles of the oxygen. These are Hydrogen bonds - which are special cases of dipole-dipole intermolecular forces, that only occur when Hydrogen is covalently bonded to strongly electronegative elements like Fluorine, Oxygen, and Nitrogen. In those cases, the Hydrogen's nucleus becomes unshielded, and can allow other polar molecules to come closer - resulting in a stronger bond. A Hydrogen Bond. Let's look at Methanol and Pentanol. From each of these structures we can see that they too, have a polar Oxygen-Hydrogen bond, which looks similar to what water has, but the other side have Carbon-Hydrogen bonds, which are very weakly polar since the electronegativity differences between Carbon and Hydrogen is quite small. We usually consider hydrocarbon chains to be non-polar when discussing solubility, and so overall Methanol and Pentanol are hybrids - they have a polar group on one end, and a non-polar group on the other. Glycerol has three polar Oxygen-Hydrogen bonds but these are attached to hydrocarbon chains which are relatively non-polar. Hexane is a 6 membered hydrocarbon chain, and since Carbon-Hydrogen bonds are weakly polar, we consider the Hexane molecule to be relatively non-polar. Kerosene is similar to Hexane in polarity. It's non-polar, but has more of a tree-like structure. Iodine is a non-polar molecule, with only one bond - with itself - and so there cannot be any unfair sharing of electrons to any degree, so it is completely non-polar. When it comes to explaining or determining solubility of solvents, we use a helpful phrase that goes like this: Like dissolves Like. This means that polar molecules will dissolve polar molecules, and non-polar molecules will dissolve with non-polar molecules. The reason why this occurs is because polar molecules can undergo dipole-dipole force attractions - these are simply the electrostatic attractions between the slightly positive and slightly negatively charged poles of each molecule. Non-polar molecules can't do this because they don't have poles, instead they attract each other via dispersion forces. These are the weakest forces between molecules, where all the protons of one molecule can weakly attract the electrons of a neighbouring molecule, and vice versa. The problem is that most molecules are moving too fast for these molecules to have a chance to draw each other in, but if the molecules are sufficiently long enough in length, then the contact area is increased which allows for stronger attraction to occur. Let's look at some examples from our observations table: Methanol and Water underwent complete dissolution - this agrees with the theory that polar molecules dissolve in other polar molecules. Similarly with Pentanol and Methanol. 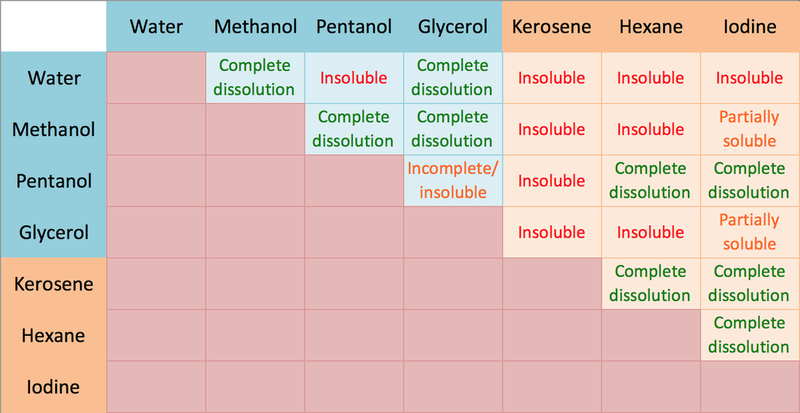 In fact, I have colour-coded the upper left half of the table in blue to denote the polar molecules, and orange in the lower right to denote the non-polar molecules, and they seem to agree with the the rule except for some exceptions. Water and pentanol have a lower solubility than expected. Why? Although both solvents have polar groups attached, the proximity and strength of the hydrogen bonds between water molecules will be much greater than when pentanol is in the mix with its long non-polar hydrocarbon tail interrupting the hydrogen bonding of the water molecules surrounding it. The water molecules will expel the hydrocarbon tail out of the water as a result, but keeping the polar Oxygen-Hydrogen bond close by to partake in hydrogen bonding. This will result in fewer molecules of Pentanol being able to dissolve. Glycerol and Pentanol did not appear to mix, and I find this strange since they are both polar, and both contain non-polar groups too. When we examine their structures, we can see that the OH groups can undergo hydrogen bonding, but the non-polar groups have difficulty finding a site of good contact. When molecules can't interact due to their shape - we call this steric hinderance. Iodine and glycerol do not appear to mix very well despite glycerol having non-polar carbon chains. I would suspect that this is due to Glycerol's strong network of hydrogen bonds between themselves, preventing little space in between (steric hinderance) for Iodine to attract to the hydrocarbon branches via dispersion. Why does Iodine mix with Pentanol, but not so well with its smaller cousin - Methanol? The reason is the length of Pentanol's non-polar hydrocarbon chain. Dispersion forces amongst non-polar molecules is stronger between bigger and longer molecules - this provides much more protons and electrons to attract each other. Pentanol's longer hydrocarbon chain enables more contact area for the Iodine to bind. Glycerol and Hexane did not appear to mix at all, this was a counter-intuitive result since we had established earlier that Hexane was non-polar, and Glycerol was both Polar and Non-polar. The reason why they cannot mix very well is likely due to the shape of the Glycerol molecule - remember that for dispersion forces to bond strongly there needs to be sufficient contact area and proximity, neither of which can be achieved very well with Glycerol's tree like shape. The hexane molecule will have difficulty twisting and bending to conform to Glycerol's hydrocarbon branches, and so very little will be able to mix.